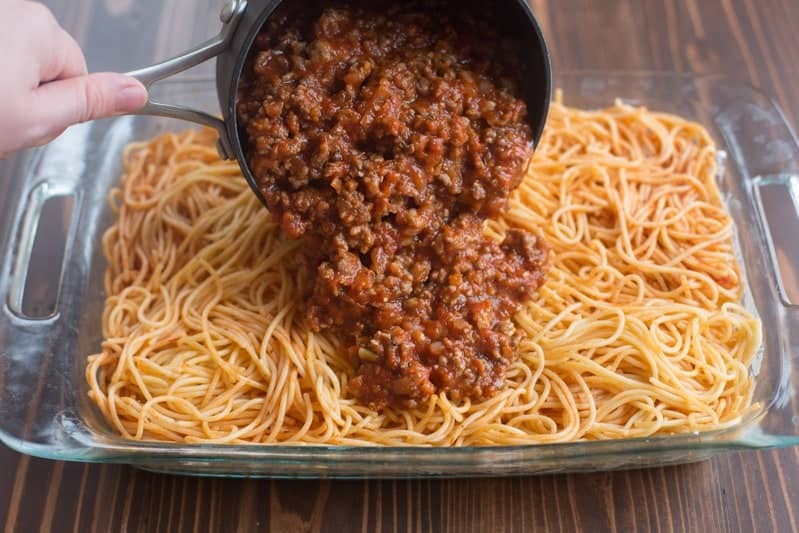 Million Dollar Spaghetti is a DELICIOUS easy dinner idea! 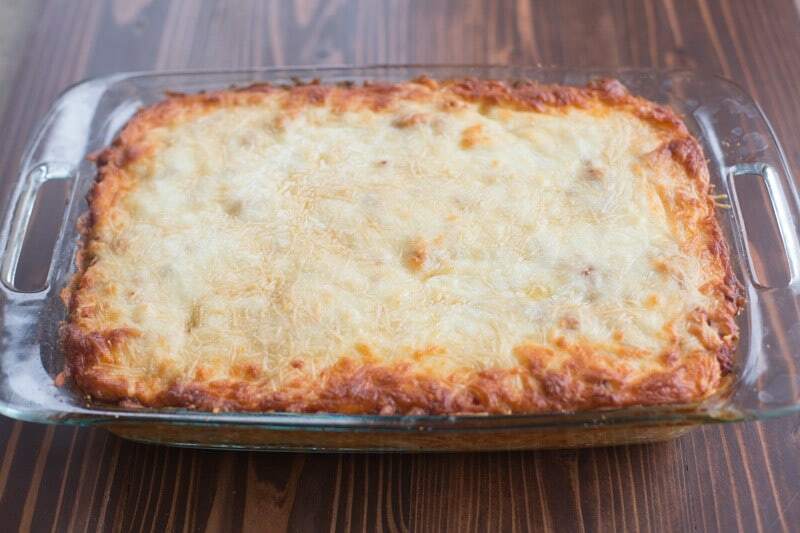 The noodles are layered with a cheesy center and topped with a yummy homemade meat sauce and cheese. 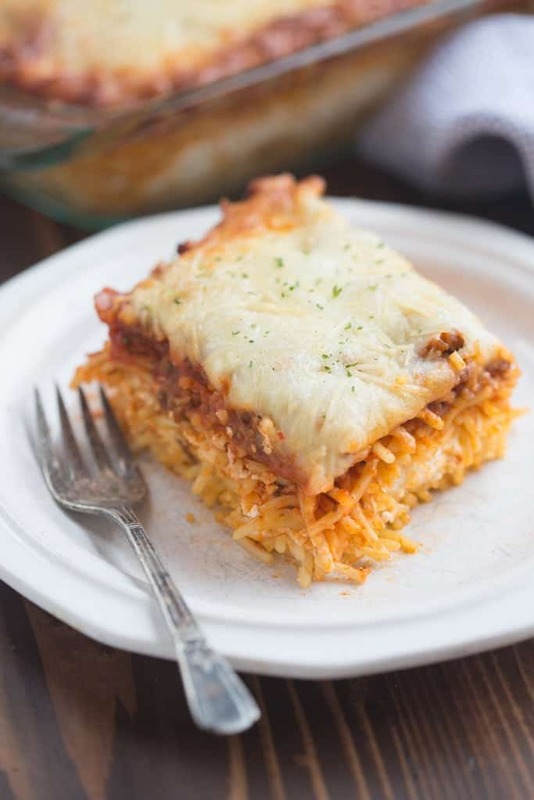 Million Dollar Spaghetti is like the happy marriage of my favorite Spaghetti pie, to a classic lasagna. 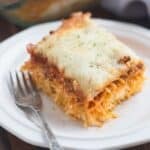 The noodles are layered with a cheesy filling in the middle, then a yummy meat sauce and cheese on top. YUM! Contrary to what the name might lead you to believe, it’s a super inexpensive meal to make, but it DOES taste like a million bucks 🙂 . Your family will LOVE you for this one! Start by boiling a package of spaghetti noodles. Once cooked, drain the water and toss them in a bowl with some butter and a little marinara sauce. Pour half the noodles in a pan and spread a creamy, cheesy mixture on top. Then add the remaining noodles on top, creating a little surprise filling inside. Next add your marinara meat sauce, and extra cheese on top to finish it off. Bake until the cheese is melted and bubbly. I love it when the cheese on the edges get golden –YUM!. I like to use both ground beef and ground Italian sausage in this recipe. It adds really great flavor. 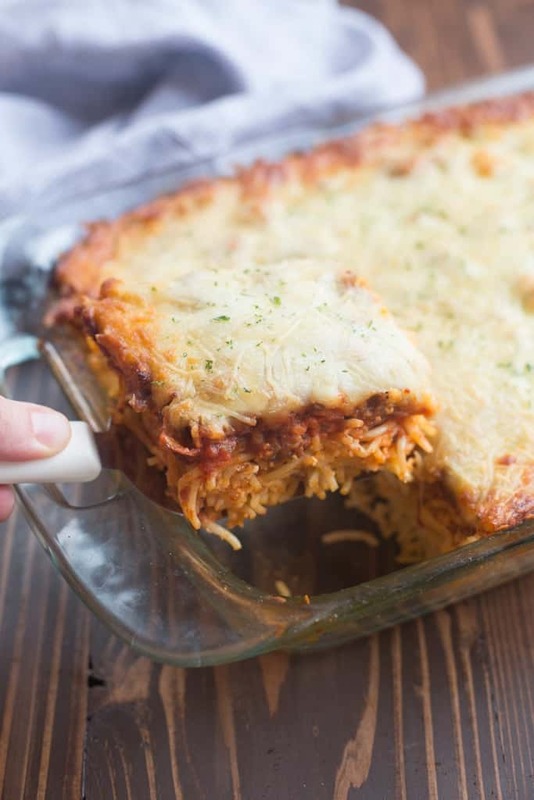 You could freeze the leftover 1/2 pound of Italian sausage and save it for another recipe down the road, like Baked Ziti or Pizza Casserole. Prepare recipe right up until the baking step. Cover well with greased aluminum foil and freeze. When ready to eat, thaw in the refrigerator for 1 to 2 days, then bake for about 20 minutes covered and then 15-20 minutes uncovered. If baking from frozen, bake covered for about 40 minutes, then uncover and bake 20-30 minutes longer, or until bubbly and warm. In a large skillet cook and crumble the ground beef and Italian sausage and season with salt and pepper. Remove most of the grease. Add onions and garlic and cook for a few minutes until onion is translucent. Add all but 1/2 cup of the marinara sauce (reserve 1/2 cup for the noodles) to the mixture and stir to combine. Set aside. Cook Spaghetti according to package instructions, just until “al dente”. 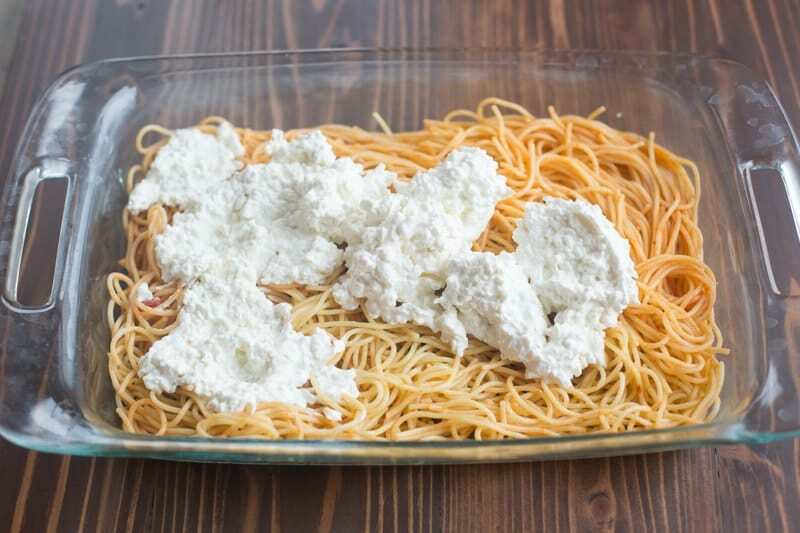 Place hot spaghetti in a large mixing bowl with butter and 1/2 cup marinara sauce and toss to combine. Pour HALF of the pasta into a 9x13’’ pan. Combine cream cheese, sour cream and cottage cheese in a bowl and mix well. Smooth over noodles in the pan. Top with remaining noodles. Add meat mixture on top and smooth into an even layer. Top with mozzarella cheese and parmesan cheese. Bake for 30-35 minutes or until hot and bubbly. Check it around 20 minutes and if the cheese is browning too quickly, place a piece of tinfoil over it. Wait about 10-15 minutes before cutting and serving. Enjoy! This is a great freezer meal! Tips for freezing this recipe are listed in the post above! I love to serve this with Homemade Olive Garden Breadsticks! This looks so amazing! Easy and so good! Your pictures are stunning! Can’t wait to try it! My kids loved this dish. Thank you for sharing. Absolutely delicious! My husband loved it. Thanks for putting the recipe out there.